Enveloped. Spherical to pleomorphic, about 80-100 nm in diameter. About 20% of of released viral particles already contains dsDNA genomes. 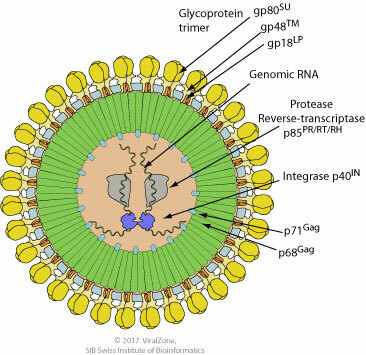 This is due to an unique feature of spumaviruses in which the onset of reverse transcription of genomic RNA occurs before release rather than after entry of the new host cell like in other retroviruses. Monopartite, linear, dimeric, ssRNA(+)/dsDNA (depending on the timing of reverse transcription) genome of about 12 kb, with a 5'-cap and a 3’poly-A tail. There are two long terminal repeats (LTRs) of about 600nt long at the 5' and 3' ends. The LTRs contain the U3, R, and U5 regions. There are also a primer binding site (PBS) at the 5’end and a polypurine tract (PPT) at the 3’end. The integrated provirus utilizes the promoter elements in the 5’LTR to drive transcription. This gives rise to the unspliced full length mRNA that will serve as genomic RNA to be packaged into virions or used as a template for translation of gag (Gag protein, p3). The spliced mRNAs encode (pro)pol (PR, RT, RnaseH, IN) and env (Leader peptide, SU, TM). Incompletely spliced mRNAs contain cis-acting sequences that directly bind cellular factors to allow export from the nucleus into the cytoplasm. The genome encodes for two additional ORFs encoding bel,and tas that are expressed predominantly by the internal promoter (IP) localized in the env gene. ssRNA(+) or dsDNA genome enter the cell. ssRNA is copied into a linear dsDNA molecule by the reverse transcriptase. Nuclear entry of the viral dsDNA which is covalently and randomly integrated into the cell’s genome by the viral integrase (=provirus). Transcription of provirus to form viral RNAs and splicing. Translation of the RNAs to form precursor polyproteins. Late reverse transcription can occur. Assembly of the virion and packaging of the viral RNA genome. Budding predominantly into the endoplasmic reticulum (ER) and occasionally through the plasma membrane, most viral particles remain in the cell.